What do you mean by readability? 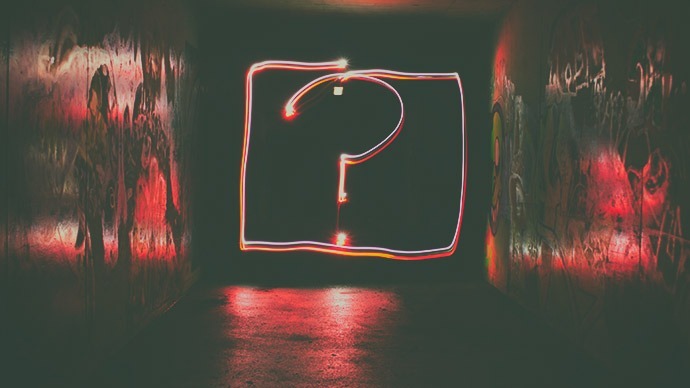 It’s a fair question - what does it mean for content to be readable? Isn’t it subjective? At its core, readability is about making your text easy to read. Your top priority should, of course, be to write rich, engaging content. But, if it’s too laborious for the reader, you won’t be able to communicate well with them. Quality writing and clarity of writing go hand-in-hand. Readability formulas are such a powerful way to analyze and simplify writing that they are used widely in education. In addition, they have also become increasingly recognized as a valuable SEO tool. Readability is so important because simplifying your content will help you to clarify your message for the general public. Most readability formulas calculate what US grade level the audience would have to be reading at to understand the text. It’s not just us who think readability matters. Google thinks so, too. So much so that they consider it a key ranking factor. By producing content your readers will happily read more of, you’ll keep your readers on your page - Google will reward you for your efforts. Readability ranks. How do I find my readability score? There are several readability formulas published which calculate how readable your text is in different ways. ReadablePro is a tool which uses a bespoke combination of the most respected and reliable algorithms. It analyzes your text as a whole and gives you a unique readability rating. It also gives you guidance on how to tweak your work to improve its rating. As well as our ReadablePro readability score, we give you a breakdown of how your text scored on several different readability formulas. To see how readable your content is, try out a free ReadablePro demo. You can type or paste directly into our text tool and then edit your text - the readability score will update as you type. What are levels of readability? 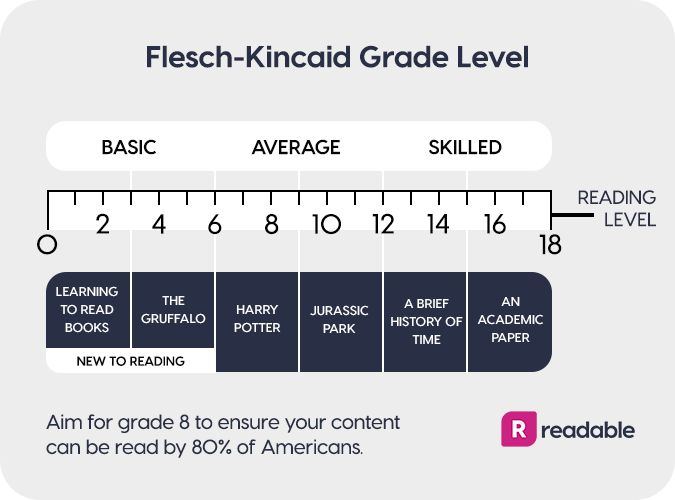 Levels of readability align with school grades in the USA education system. The higher the grade level of your content, the more years of education are required for 100% comprehension. 90.0–80.0 6th Easy to read. It might surprise you to learn that the average reading grade of the general public is around grade 8. If readability is something you don’t currently consider when writing, it’s likely your writing is above this reading level and isn’t getting as wide an audience as it could be. You could be losing potential customers. This is why it’s best to edit your work until it reflects a lower numeric reading grade level. The higher the reading grade, the more difficult it is to understand. A common argument against plain English is the idea that it’s somehow ‘dumbing down’ language. However, when writing is too convoluted and complicated, these distractions only serve as a mask for a badly written piece. Simplifying your text will reveal to you whether or not your content has a strong core. It’s actually quite easy to shroud writing in phrases which confuse the reader - it takes some craft and skill to clarify your writing. If you think making your text more readable is oversimplifying it, you’re putting the onus on your reader to understand your content on the first read. It’s up to you as the communicator to send a clear message that the reader can quickly and easily understand. If you’re worried about patronizing your reader, make sure you don’t patronize them with the tone of your writing. Using plain English in itself isn’t going to give a condescending impression. On the contrary, your reader will appreciate your efforts to get to the point and respect their time. What’s a good readability score? We know that different formulas sometimes have different criteria and this can get a little confusing. That’s why ReadablePro gives you an average grade level. We convert this to a simple letter grade that’s easy to understand. After all, we should practice what we preach. As mentioned above, the typical reading grade of the general public is around 8 - your blogs, emails and social media content should aim for around this grade. All our readability ratings show you your average numeric grade level as well as the letter grade. With ReadablePro, don’t be discouraged if you see your content earn a readability rating of C or D.
Try splitting up some sentences and simplifying some words and your rating will improve in no time. How do you improve readability? We talked about the prospect of your writing getting a bad readability rating. But, how do you improve the readability of your content? First and foremost, you’ll want to have a customer focus. Rethink your piece from the perspective of your customer and ask yourself if you would understand this from an outsider’s perspective. Keeping your customer in mind is vital when aiming for great readability. Get a baseline score for how readable your piece currently is and then look over the ReadablePro pointers and highlights for how to improve. With this in mind, you’ll want to use the sidebar in our text editor to identify the passages in your text which need the most work. You can then hover over each highlight to get an idea of how to turn it around. Is readable a real word? In a word, yes. Readable has a similar meaning to the word ‘legible’, but it is broader. As well as meaning that writing is clear, it also means it’s enjoyable. Both of these things go hand-in-hand - if your writing is clear, it will be more enjoyable to read. How readable is your content? Run it through ReadablePro to see how you could be engaging a wider audience, improving your SEO strategy and communicating effectively with your reader.